Michael Johnson never set out to be a trailblazer or pioneer. He never sought to become a hero to many. He just knew that he loved racing and spending time with his dad at the track. But fate had other designs for him. 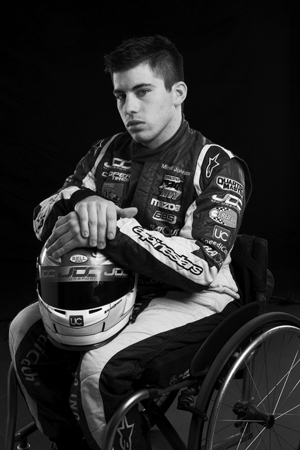 One fateful day in August of 2005 set him on a path that would eventually lead to him becoming the first paralyzed driver to compete and win in open-wheel racing. When the training wheels came off of Johnson’s bike in a literal sense, they also began to come off of his racing career in a more figurative one. Moving up from one class of motorcycles to another in quick succession, capturing victories and championships along the way, Johnson began to make his mark in the two-wheeled world, transitioning quickly to the pro ranks in a sport dominated by youth. Michael was 12 years old, and with 14 racing championships already to his credit, the future was bright. Discussions were already underway for him to participate in the KTM Red Bull Rookie Cup (a junior series for MotoGP), and the sky seemed to be the limit. But that sky turned dark on August 13, 2005. What was to be a routine run on a nearby dirt track turned tragic in an instant. “I was in Sarnia, Canada, at a half mile dirt horse track,” Johnson remembers. “It was about midway through the day, and it was a heat race in the 250 mod class. I didn’t get a very good start, and it was a five-lap heat race for the 20-lap main later that night. “I started working my way through the field, and with two laps to go I ran out of tear-offs. I wiped my shield with my left hand because my right hand was on the throttle. I remember going into turn 3, and I went high towards the hay bales along the edge of the fence and then cut down to try and make a pass for the lead. I remember getting sprayed (from competitors ahead) and wiping my shield again. Then I either hit a rut or someone’s rear wheel and it sent me straight right off track into a wood post. Catapulted into the a wooden fence surrounding the track at top speed, Johnson’s life was changed forever in the blink of an eye. “The handlebars hit me so hard in the chest that it just blew my back out,” Johnson says. His back was completely severed by the impact at the T5-T6 vertebra, right in the middle of the chest. “I broke all the ribs on my right side and my left collarbone. It also shattered my left ankle and splintered up to the tibia and fibula. I totally destroyed two vertebra in my back, and I also fractured my pelvis. “The weird part was that it wasn’t that bad of a crash. I’ve had much more violent crashes where I thought I broke every bone in my body but was able to get up and walk away. I didn’t even get knocked out, so I remember everything up until that point. The accident is etched in Johnson’s dad’s mind forever as well. Standing nearby turn 4 where the accident happened, his father Tim was one of the first to get to Michael after the wreck. He recalls that his son’s thoughts never left the racetrack while the incident was unfolding. Damage happens quickly, but unfortunately our bodies don’t heal at the same rate. While lucky to be alive, Johnson’s road to recovery was just beginning. Once transferred to the Children’s Hospital in Detroit, he had his first back surgery and spent the next two months attempting to recover and piece his young life back together. Tim remembers a focused son who was looking for an outlet for his racing passion, and one was found during his recovery.